The Euro Interbank Offered Rate (Euribor) is an interest rate based on the average interest rates at which a panel of European banks lend money to one another. 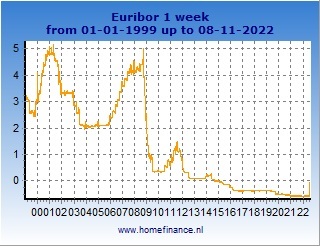 The Euribor interest rates are calculated daily and made public at 11:00 Central European Time. Until the 1th of November 2013, the Euribor rates came in 15 maturities: 1, 2 and 3 weeks and 1, 2, 3, 4, 5, 6, 7, 8, 9, 10, 11 and 12 months. However, Euribor-EBF decided to discontinue Euribor fixing for a number of maturities (3 weeks and 4, 5, 7, 8, 10 and 11 months). The overnight rate for unsecured interbank lending in the euro-zone is called the Eonia rate. The Euribor interest rates are being used as a reference rate for a lot of financial products, for example derivatives like swaps. A lot of banks use the Euribor interest rates also to determine their rates on products like mortgages, savings accounts and loans. In the following table we show the latest Euribor rates. For more information, click on the links in the table. Important notice: due to a change of policy by the Euribor EBF organisation, as of March 1th 2014 euribor rates are available to the general public with a 24 hour delay only. 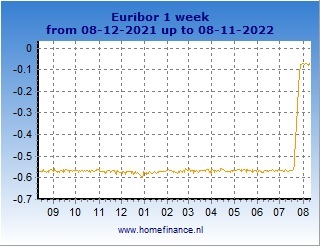 No website or other source is allowed to publish realtime Euribor data anymore publically. The left charts show all the Euribor rates from the start. The right charts show the rates in the latest 12 months. You can select all available Euribor rates (maturities). Euribor® and Eonia® are registered trademarks of the EMMI (European Money Markets Institute). All rights reserved! The only original sources of Euribor® data are www.emmi-benchmarks.eu/ and www.reuters.com.